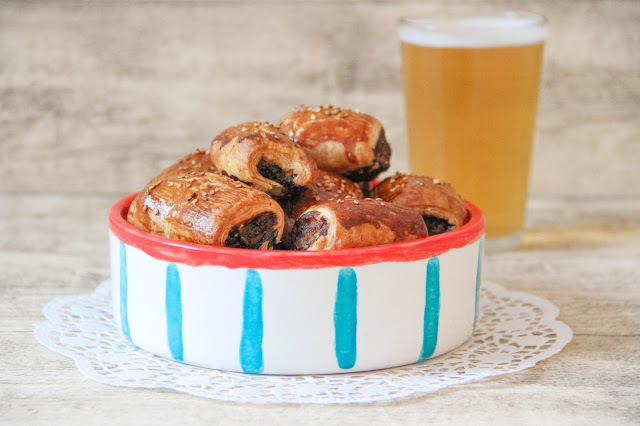 Game day, Christmas, Summer Party, Movie Night… to only name a few occasions for which you can prepare these little bad boys. For the last Christmas Eve I was in charge of the aperitivo. I was trying to make something really tasty which wouldn't fill people up too much, as the food prepared by my dad was heaven. 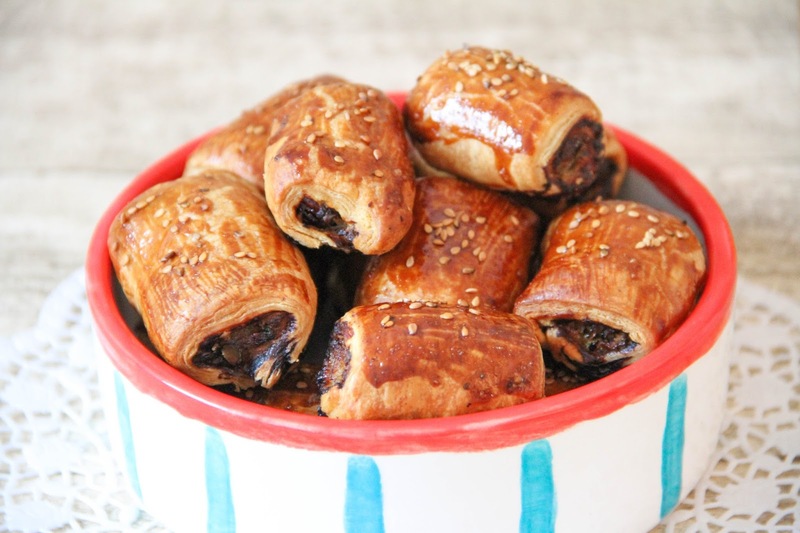 At the supermarkets you can find loads of little canapés that are usually made out of puff pastry. So indeed, I wanted to prepare something that includes puff pastry as well. I heard that the British had this famous little thing called sausage roll. Not too much of a fan of a purely meaty canapé, especially as most of them are made out of really greasy meat, I was trying something on my own. I've seen canapés with nuts or with dried fruits, so I thought I would just bring all of the not meaty flavorful elements together. And I have to say, my family just loved it!!! Heat the olive oil in a large frying pan before you add the onion and a pinch of salt. Sauté for around 5 minutes. Then add the garlic and continue for another 5 minutes. Remove the frying pan and let completely cool. In a large bowl mix the pork meat, pistachios, cranberries, grated apple, vinegar and parley as well as the onion until well-combined. Season with salt and a generous amount of black pepper and mix again. Cut each pastry sheet into three roughly 8cm large and 5 cm wide strips. In a small bowl, combine the milk and egg with a fork. Align the rectangles in a row and place 1tsp of stuffing on one side of each of them. Roll up to enclose the filling, then brush some egg mixture along the side to seal. Repeat until all the stuffing is used up. 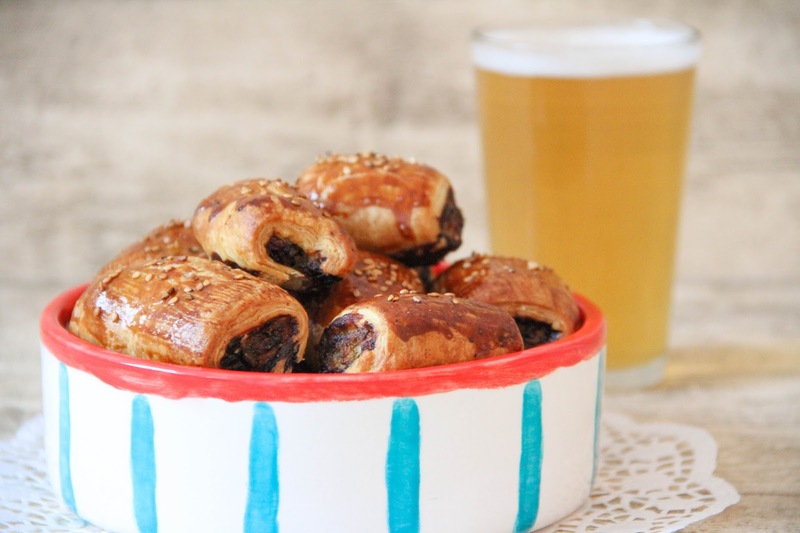 Place the mini sausage rolls onto a tray lined with baking paper. 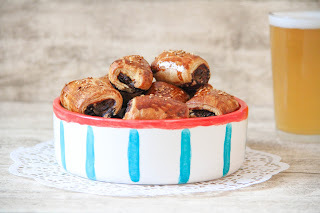 Coat each sausage roll generously with the remaining egg mixture and sprinkle with sesame seeds. Bake the sausage rolls for 30-40 minutes depending on your oven until golden brown and crispy. When ready, take them out of the oven and serve hot.